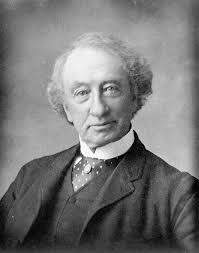 Today in Masonic History John Alexander Macdonald is born in 1815. John Alexander Macdonald was a Canadian Politician. Macdonald was born in Glasgow, Scotland. At the age of 5 the family immigrated to Kingston, Canada where a large group of the Macdonald family were already living. Macdonald's father was an unsuccessful merchant with three failed businesses in Scotland and at least two in Canada. Despite that at the age of 10 the family was able to scrape together enough money to send Macdonald to school until the age of 15. This was the common age for most people, except those of the wealth, to leave school. Macdonald would later in life regret that he had not gone one to more education. After leaving school Macdonald's parents insisted that he become a lawyer. They saw him as someone who well suited for a job that required education. At the time there were no law schools in Canada so Macdonald headed to York (now Toronto) where he passed a test setup by The Law Society of Upper Canada (now southern Ontario). Once he had passed the exam he was sent to apprentice with an attorney. Macdonald's supervising attorney died of Cholera just 4 years into his apprenticeship. At the time Macdonald was working for his mentor's cousin in another town. Macdonald returned to Kingston a year later and began practicing law even though he would not officially be accepted to the bar until 1836, almost two years after his mentor had passed away. From 1836 to 1843 Macdonald worked hard to establish himself as a community leader in Kingston. He was on the board of several businesses and had heavily invested in real estate in Toronto. In 1842 Macdonald had become ill and shortly after his father had passed away. Ill and struggling with his grief Macdonald decided to go to Britain for a few months. It was there that Macdonald would meet his cousin and soon to be wife Isabella Clark. The couple were married in Canada in 1843. When Macdonald returned to Kingston in 1843 he announced that he would run for Alderman. He was successfully elected in March of that same year. The victory also had it's downside when supporters carrying Macdonald in celebration dropped him into the slushy street. The following year Macdonald was asked to run for the Legislative Assembly which met in Montreal. He agreed and won the seat. Macdonald was never much of an orator and instead he focused on becoming an expert on Election Law and Parliamentary procedure. The next year, 1845, Isabella had a recurrence of a previous illness which made her an invalid. Hoping a warmer environment would help her, Macdonald moved her to Savannah, Georgia where she would live for the next three years and where their first son, John Jr., would be born. John Jr. would pass away suddenly. In 1850 Macdonald's second son Hugh would be born. Through out the 1850s Macdonald was very active in politics in Canada. He would serve in government positions from attorney general to premier. In 1863 and 1864 a see-saw battle was being waged between Macdonald, along with fellow conservatives, and the Grits, liberals. A large part of that battle revolved around the American Civil War. There were fears in Britain and Canada that once the United States was done fighting each other, they would invade Canada. Because of the British Government asked the Canadian colonies to pay for a portion of the defense in the form of a Militia Bill. Many saw the issues of the time as the end of the constitution of the province of Canada. George Brown the opposition leader took the opportunity to reach out to Macdonald and together they helped form the Great Coalition. The Coalition combined the regions of Canada turning all the provinces into the Dominion of Canada on July 1st 1867. On that same day Macdonald was knighted. Today July 1st is known as Canada Day. With Canada a new country, Macdonald was elected it's new Prime Minister. He would serve in the position for 19 years (non-consecutive) from 1867 to 1891. The break in Macdonald's 19 years came in 1873 with the Pacific Scandal regarding Canada's railway system. Allegations were made that Macdonald and several ministers in his government had taken money from Northern Pacific Railway in the United States. After the scandal Macdonald offered his resignation as head of the party, it was refused. Macdonald would return to the office of Prime Minister in 1878. In 1891 Macdonald, now 76, collapsed in March during the campaign. He seemed to improve, but by May of that year he had a stroke and would die in the beginning of June. Macdonald was a member of St. John's Lodge No. 758 in Kingston, Ontario.